Forklift Hydraulic Control Valves - The job of directional control valves is to be able to direct the fluid to the desired actuator. Normally, these control valves consist of a spool situated in a housing made either of cast iron or steel. The spool slides to various locations within the housing. Intersecting grooves and channels direct the fluid based on the spool's position. The spool has a neutral or central location which is maintained with springs. In this particular position, the supply fluid is returned to the tank or blocked. When the spool is slid to one side, the hydraulic fluid is routed to an actuator and provides a return path from the actuator to tank. When the spool is moved to the other direction, the supply and return paths are switched. Once the spool is allowed to return to the center or neutral position, the actuator fluid paths become blocked, locking it into position. The directional control is usually made to be stackable. They usually have one valve for each and every hydraulic cylinder and one fluid input which supplies all the valves inside the stack. Tolerances are maintained extremely tightly, so as to deal with the higher pressures and to prevent leaking. The spools would usually have a clearance in the housing no less than 25 Ã‚Âµm or a thousandth of an inch. To be able to avoid distorting the valve block and jamming the valve's extremely sensitive components, the valve block will be mounted to the machine' frame by a 3-point pattern. The position of the spool may be actuated by hydraulic pilot pressure, mechanical levers, or solenoids that push the spool left or right. A seal enables a portion of the spool to protrude outside the housing where it is accessible to the actuator. The main valve block is generally a stack of off the shelf directional control valves chosen by flow performance and capacity. Some valves are designed to be on-off, while others are designed to be proportional, as in valve position to flow rate proportional. 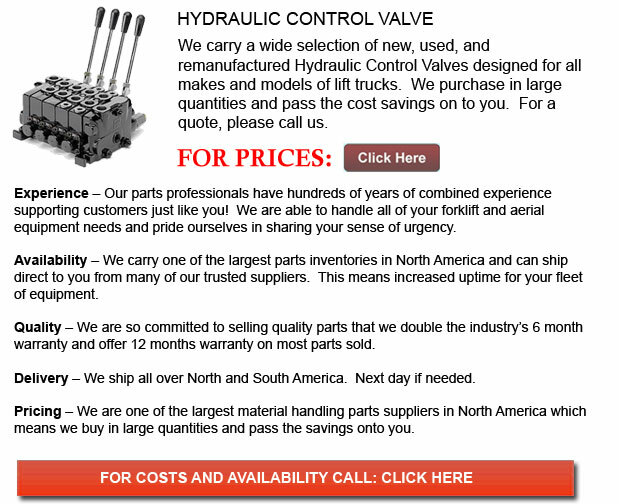 The control valve is among the most expensive and sensitive parts of a hydraulic circuit.